It’s almost as if people were saying this before they even saw it, but the now clichéd, “nothing much happens in The Happening” comment is not that far from the truth - but as always with Shyamalan, there is something that makes his films unique, and much like I did in the superior, but widely unpopular, The Village, I almost found it in this one too. The hype machine certainly didn’t work in this film's favour, though. Building such a film up the way they did, and then have not much really materialize is bound to bring calls of “worst film ever” from the sadist IMDB crowd after all. In no way are the films similar, but it can be at least said that The Happening is an improvement over Night’s last film - the bizarre and pretentious Lady in the Water - and a step in the right direction getting back to what he knows whilst NOT being the nail in the coffin of his career some would have you believe. Taking it in it’s stride, the film’s fairly preposterous concept of an airborne toxin that blocks out a chemical in the brain, one that prevents us from doing self harm, is chilling enough if you choose to accept it and the script is smarter than it probably should be given the Twilight Zone atmosphere. Not allowing a concrete explanation for the events which would take away some of the fun, supernatural element, we are still surrounded by math and science teachers constantly reminding us to think logically about the whole thing. The initial terrorist panic reaction is a fairly realistic one in a post 9-11 world, but that is soon done away with as more and more people off themselves allowing the theories to flood in. Night injects some much needed, but certainly odd humour as well. Working the paranoia effectively, the whole film is reminiscent (in a positive way) of classic B-grade efforts of the 1950s. The horror is done pretty well overall too, and certain scenes that include the various ways people kill themselves, are effective and dripping with intensity without being overly blood splattered or corny. This is the film’s strength because as it goes on, it becomes clearer that our main characters don’t really have much to do besides run from the wind. That might sound peculiar and tedious, but Night has some old school style and he paints a bright looking film that takes advantages of using more of the actor’s physical emotions with some slightly startling (at first) framing. Zooey Daschanel (playing Elliott‘s estranged wife) and Mark Wahlberg (who plays our hero science teacher, Elliott) are fine despite not really getting to develop much given all the running away they do. I won’t deny it though, there are some moments of cringe worthy deliveries, and perhaps Wahlberg just wasn’t the right guy for the role. I like him, but there’s no argument here that the guy is a wooden performer. But, and besides a few disasters bit player wise, the acting overall is not as bad as some reviews have made it out to be. 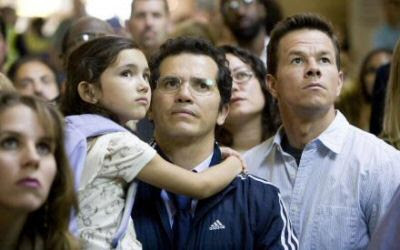 The Happening is a good example of what Night does these days - he has great ideas and even though he can make the execution look and sound good, they all end up being fairly hollow and forgettable. It’s climax is a disappointment, but I suppose the plan was to be so invested in our lead couple we should appreciate the unexpected, slightly positive ending - a tacked on ‘it‘s not over’ moment should really have been left for after the credits though. Worth seeing if you’re a fan, it’s best to just make up your own mind. It’s purely glossy B-grade fun and I don’t think the director intended it to be much more than that. Everyone should just chill out with the ‘worse film of the year’ comments - this isn’t Date Movie people.